Sears and Montgomery Wards or Monkey Wards as it was known, were the two stores of choice in the Hudson Valley before malls on Route 9 changed everything, well now they’ll both be nothing but a memory. No reference will be made of the common use of the Sears Catalog. The orders poured in from everywhere — 105,000 a day at one point — so much so that the company became an economic force. It could make or break suppliers by promoting their products. It could dictate terms on manufacturing. Its headquarters city boomed as this tech-driven retailer built huge warehouses and factories and attracted other businesses and rivals. State and local governments complained that the company was harming small-town retailers. 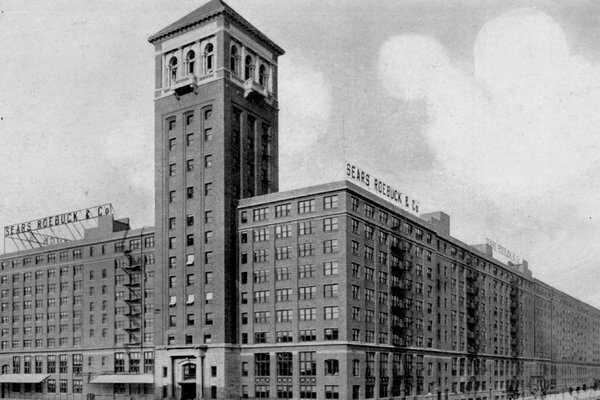 That was Sears, Roebuck & Company in the early 20th century in Chicago. But at various times in the history of retailing you could apply like descriptions of retail might to Walmart, Kmart, Safeway, A.&P., and F.W. Woolworth, whose Downtown Manhattan headquarters building was christened the “Cathedral of Commerce” when it opened in 1913. Today the Woolworth Building is a luxury condo whose young residents are probably unaware of the extraordinary entrepreneur who built it. Which is to say that becoming the nation’s leading retailer does not guarantee immortality, at least not beyond architecture. Sears, once America’s dominant retailer, has filed for Chapter 11 bankruptcy protection after 132 years in business. Sears became the Amazon of its day because its co-founder Richard Warren Sears harnessed two great networks to serve his enterprise — the railroads and the United States Postal Service. When the Postal Service commenced rural free delivery in 1896 (the “last mile” in today’s jargon) every homestead in America became within reach. And Richard Sears reached them. He used his genius for advertising and promotion to put a catalog in the hands of 20 million Americans in 1900, when the population was 76 million. The Wish Book or Big Book or Dream Book, as the catalog was variously called, could run a staggering 1,500 pages and offer more than 100,000 items. And when one of his pants suppliers, the manufacturing wizard Julius Rosenwald, became his partner, in 1886, Sears was on the way to becoming a vertically integrated juggernaut. Whether you needed a cream separator or a catcher’s mitt, a plow or a dress, or an entire house, Sears had it. “No matter where you go or how long you look, you’ll not find values approaching those this book presents,” the spring 1922 catalog declared. Sears would carve up the catalog landscape with a local rival, Montgomery Ward. Remember it? Probably not. The e-sales promotion company Groupon, itself once mighty and now clinging to life, occupies part of Ward’s former headquarters in Chicago. Sears, Montgomery Ward and another Midwestern-born general merchandise retailer, J.C. Penney, dominated postwar American retailing, controlling 43 percent of department store sales by 1975. But even by then, Sears was beginning to falter under waves of new competition. The company was not alone. A.&P., which introduced the first cut-rate grocery store in 1912, was also sliding into a long decline that would last through decades of ownership and management changes. Great A.&P. went through the final checkout lane in 2016 following its second bankruptcy. (Or was that the third?) A.&P. once operated 15,819 stores and ran the world’s largest food packaging plant, in Horseheads, N.Y. The company was so powerful that in 1949 trustbusters tried to slice it into seven independent companies. Even before that, states passed “chain laws” that included minimum markups, so small stores couldn’t be undermined by the loss leaders that A.&P. would offer to attract shoppers. A.&P., a vicious competitor, buried local retailers anyway. By the inflation-racked 1970s, though, A.&P. was struggling against nimbler chains such as Safeway, which became the country’s top grocer, and Kroger, as well as new models of retailing such as big-box stores. Walmart’s eventual move into groceries would help seal A.&P.’s fate, and, at the same time, make the Arkansas company the nation’s top retailer, where it remains. For now. A.&P. would later show some dubious creativity when in the early 1980smanagement scrapped and replaced the “overfunded” pension plan, plundering it for operating capital. This piece of sliminess was copied all over corporate America, signaling the end of the pension plans that so many workers depended on for retirement income. In its earlier days, with strong leaders such as Robert E. Wood, Sears was able to negotiate huge shifts in the economic and demographic landscape. By 1925, more Americans were living in the cities than in rural areas. Sears followed them by opening retail stores. The postwar boom would give rise to the suburban shopping mall, and Sears could easily finance and grab what were then (but not necessarily now) the best locations across the country. By the mid-1980s, after a restructuring, the company briefly blossomed anew, in part by becoming a more full-blown conglomerate that owned Allstate Insurance and the Dean Witter brokerage. Sears also tried to crack the credit card market with its Discover card. The rationale was that Americans trusted Sears on the spending side of family finance, so why wouldn’t they do the same on the savings side? The proposal was framed this way: “Would you buy stocks where you buy socks?” Answer: Not really. High up in the Sears Tower, management couldn’t see that the retail landscape was changing. Sears couldn’t compete effectively with Walmart and the growth of big box merchandisers such as Toys “R” Us. But more important, the company could not summon the vision to anticipate the internet. By 1993, Sears had closed its national network of warehouses and exited the catalog business — which is basically e-retailing without the “e.” Amazon shipped its first book in 1995. Which brings us to Eddie Lampert, the chief executive of ESL Investments, who bought Sears in 2005 figuring, wrongly, that he could reinvigorate it. Mr. Lampert recently blamed Sears’ retirees for some of the company’s problems, complaining that paying them the money they were owed was holding the company back. He’s spent a decade shrinking Sears (and Kmart, which is part of the parent company, Sears Holdings) and then blamed the economy, the weather, Walmart, Amazon and everything else when his plan foundered. Saddled with debt it can’t afford, Sears is filing for Chapter 11 to keep itself afloat through the Christmas holidays. No one wants to buy into Mr. Lampert’s latest restructuring plan, which would sell ESL control of some of Sears’ best remaining assets, including the Kenmore appliance brand. Amazon, the world’s leading e-tailer, is now one of the biggest clients of the . Postal Service. As Sears did in 1925, Amazon has moved into brick-and-mortar retail, buying Whole Foods and opening its own stores as it tries to close the store gap with Walmart. And the company has gone well beyond any retailer in terms of diversification, including web and cloud hosting, original content, fashion, hardware, even an airline fleet. Amazon certainly has the government’s attention, or at least the president’s, and its recent announcement of a minimum wage of $15 an hour for all United States employees will stave off some of the withering criticism about its employment practices. Amazon’s goal is to be less disliked than Walmart, apparently. Certainly, Amazon looks unassailable in its current form. So did every retailer that became the biggest dog on retail’s porch. They were all innovative. They all pushed the boundaries on pricing, sourcing, marketing, regulation, employment, expansion and tax breaks. They all ultimately lost their way. Sears is the latest chapter in that story. And probably not the last. Excellent article, Peter. You should teach graduate courses in business…or do you? I am forwarding this to my son, William, in Washington DC who will enjoy it immensely.